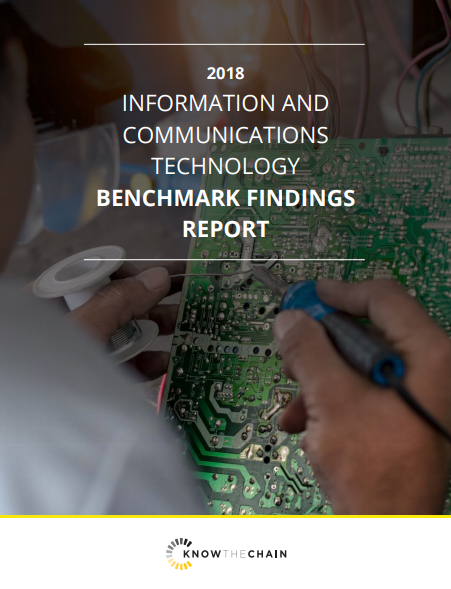 string(1055) "Resource Centre > Uncategorized > 2018 ICT Benchmark Findings Report"
This report found that while technology companies are working to bring the world closer together, they are failing to connect with workers in their own supply chains. Our ICT benchmark ranked the top 40 global ICT companies—with a combined market capitalization of $4.7 trillion—on how they address forced labor in their supply chains. This year, Intel, the leader of the benchmark, overtook both Apple and HP since our 2016 ICT benchmark. Overall, major companies, including Intel, HP, Apple, and Hewlett Packard Enterprise, scored highest in the benchmark, but other important players, notably Amazon, did not perform as well. At the same time, Broadcom reduced its public disclosure dramatically, resulting in an 81% decrease in their score compared to 2016. While the majority of companies have made improvements since 2016, the report’s findings indicate that the sector as a whole needs to take stronger actions to protect vulnerable workers in their supply chains. Specifically, worker voice and recruitment, the two areas that have the most direct impact on worker’s lives, continue to be among the lowest scoring themes. In addition to ranking 40 ICT global companies and providing an analysis of company policies, the benchmark provides recommendations for companies on a path forward. Specifically, the report urges companies to engage with workers, give them access to effective grievance mechanisms, and tackle the exploitation of migrant workers by implementing ethical recruitment practices and repaying workers for recruitment fees they may have paid.